It’s easy to ‘shop local’ when you have businesses that work hard to keep their customers coming back. Here are some Evergreen Park shops that are offering holiday promotions during the month of December. Taking advantage of their deals is a great way to reinvest in your community and help ‘Keep the Green in Evergreen’. 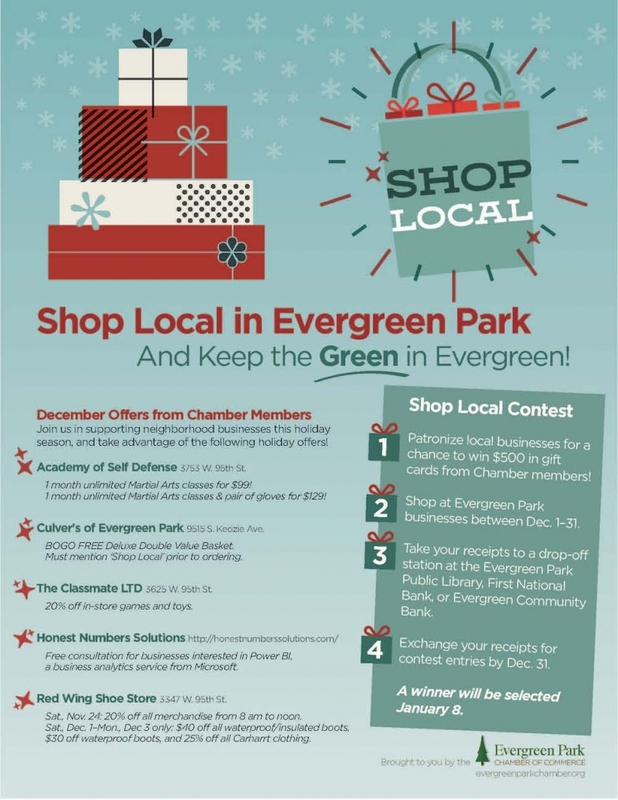 Also, don’t forget about the Chamber’s Shop Local contest, which encourages local shopping and rewards the winner with gift cards from our Evergreen Park businesses. The contest rules and holiday promotions are shown below. The holiday shopping season kicks off with the Chamber’s Community Celebration on Saturday, December 1. Join us! EPCC members are business owners and executives with extensive experience in their fields. Sharing some of that knowledge can benefit local residents. When you attend professional development events or read timely articles in your field, look for information that might interest Evergreen Park residents. Then share it! Write a press release for local media, a guest column on the Chamber’s website, an email to your customers, a blog post on your website, or a social media post. Offer helpful tips in a friendly, accessible style. Show that you care by reinvesting in the community in some way. You could join the board of a local nonprofit, donate goods or services to a family in need, volunteer for a charitable organization, or establish a scholarship for a deserving student. Create a loyalty program for returning customers—with discounts, advance notice about new products or services, and information on special offers. It could be as simple as a monthly email to your customer list, a coupon, a list of specials, or a punch card. Give your customers a reason to visit you. Organize special events that are fun to attend, useful, or both. Use these opportunities to strengthen your personal connections with local residents. Studies show that people are more likely to shop with a business that belongs to a chamber of commerce. Why? Chamber membership adds credibility. It shows that a business is professional and actively involved in the community. And it provides a host of benefits through networking opportunities, free publicity, professional development, and more. Join the Evergreen Park Chamber today! Use every tool at your disposal to build relationships with your customers. Maintain a website that is mobile friendly and updated with new information. Build an email list of customers and write to them regularly. Post on social media. Send postcards, brochures, or catalogs in the mail. Make personal phone calls. Get in front of your customers as often as you can, and let them know they matter! ‘Keep the Green in Evergreen’ is the chamber’s motto and a phrase every resident and business person should keep in mind. When consumers are more aware of the power they have to keep their community strong through their spending choices, chances are they’ll do just that.